Gousto, if you haven’t already heard of them are an amazing concept in recipe boxes delivered to your door. Containing up to four meals for either 2 or 4 people in each box, you receive a host of fresh ingredients along with recipe cards containing everything you need to cook delicious tasting meals. Being vegetarian, I opted for a box of meat free meals and was a little sceptical as to what options would be available. I have to say I was pleasantly surprised to see that not only could I pick which meals I wanted in each box, but also the choice available all sounded really tasty and I actually really fancied eating most of the recipes on offer although had to pick just two for the box that I tried. Halloumi is one of my favourite cheeses and I cook with it on a weekly basis. I couldn’t wait to try out the Harissa Halloumi Sandwich & Carrot Slaw, it looked utterly delicious on the recipe card and I hoped it would taste just as good when I made it. I found the recipe cards very simple to follow with pictures at each stage and the meal was really easy to prepare as I had all of the ingredients in front of me, measured out in the correct portions – that certainly helped with a lot of time saving. The meal was simple to put together,with everything you need included. The only things you might have to add to a meal are very basic store cupboard ingredients such as oil, salt and pepper. Any flavoured oils, herbs, spices, garlic etc are all included in small packets. As I was cooking the food I could smell the flavours and couldn’t wait for the meal to be ready and it wasn’t long before I could put my taste buds into action. A couple of days later we tried the Cheesy Risotto & Slow Roasted Tomatoes. Again simple to make and just required a bit of stirring, this was a hearty meal with a very decent portion size per person. The ingredients for this were certainly indulgent with a cute little pot of Rodda’s clotted cream to add to the final cooking stages of the risotto. Along with fresh leeks, vegetable stock, garlic, turmeric, Shaoxing wine and Dijon mustard (all of which are included) this meal was packed full of flavour and the roasted tomatoes on top were the perfect accompaniment. The finished dish looked like it had been lifted straight off of the recipe card, which is exactly what you want from a recipe box such as Gousto. I have to say I’ve been very impressed with the quality of the ingredients, so fresh and perfectly packed. The portion sizes on both meals were very good, generous even and certainly wouldn’t leave me or my husband hungry. The choice and variation of meals from week to week is excellent and if you are looking for a helping hand in the kitchen, whether for convenience, to save time or just to try out new meal ideas, then I’d definitely recommend trying out the Gousto box. It’s definitely won me over on being able to sit down for a quality, tasty meal that doesn’t take hours of preparation (thank to Gousto for doing half the work) and is something I’d use for a relaxed night with the husband where minimal cooking is involved but a lot tastier and healthier than a takeaway! 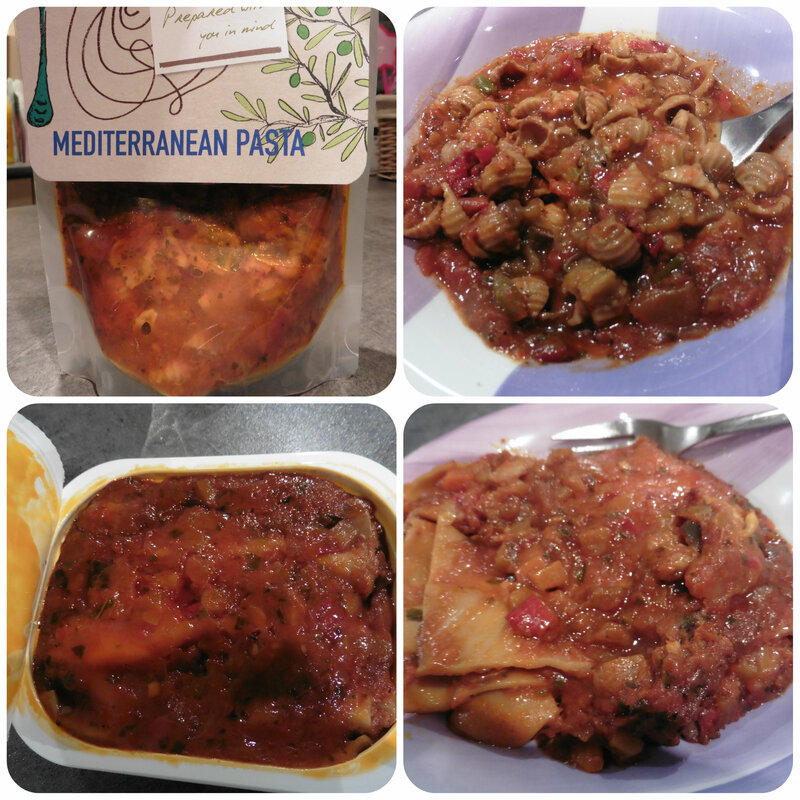 Recently I was inspired by Britmums to make tasty family meals that included a jar of Dolmio. From Spaghetti Bolognese to Mushroom & Spinach Cannelloni and a Vegetable Moussaka we’ve been enjoying delicious vegetarian dishes that are simple to put together and provide really hearty family meals packed full of healthy vegetables along with Dolmio. With a delightful array of ingredients sent to us, I was excited to get cooking. Being vegetarian I used soya mince in the bolognese which the kids enjoy (even though they are meat eaters) and the other dishes were purely vegetable based. I was surprised to learn that each jar of Dolmio provides a family of four each with 1 of their 5 a day. Dolmio Bolognese Original 500g sauce is 100% natural. In each jar, you’ll find at least 10 juicy diced tomatoes, a dollop of tomato puree, half an onion, a tablespoon of sunflower oil, a couple of cloves of garlic, a handful of herbs including basil, a teaspoon of cornflour, a teaspoon of salt, a pinch of pepper, two teaspoons of added beet sugar for taste, a squeeze of lemon juice, a splash of water and nothing more. We had to start with a traditional style bolognese – one of the kids favourite meals and one that the family all really enjoying sitting down to on a weekday evening. Now when I saw cannelloni tubes in my shopping delivery, I did think what on earth am I going to do with those? As much as I love an M&S spinach and ricotta cannelloni for a lazy meal, I’ve never braved cannelloni tubes myself. So looking at the ingredients I had and knowing the husband is rather fond of mushrooms I decided to concoct a rather simple vegetarian cannelloni with the added help of some Dolmio. I lightly fried some mushrooms along with some of the frozen spinach balls. And then came the tricky part…. stuffing it into the cannelloni! Clearly I hadn’t thought this through and as I pushed the hot mixture into the tubes they started going slightly soft.. arghh! But not to worry, a little perseverance and I soon had all the tubes well and truly stuffed! I layered a little Dolmio under the tubes then another layer on top before adding some grated cheddar and topping with Parmesan. I rather enjoy Moussaka and don’t really follow a recipe, just throw in any vegetables I have around. I started off my slicing and lightly roasting the courgette and aubergine slices and whilst they were cooking I drained the chickpeas, lightly fried the onions and made the cheesy Bechamel sauce. I then simply layered Dolmio with roasted vegetables, lightly fried onions, a handful of chickpeas and then repeated. To top it of I poured over the Bechamel sauce, added some grated Parmesan and black pepper and cooked in the oven until done. Voila! One delicious, homemade, vegetarian Moussaka! Having enjoyed Dolmio so much we popped a couple of jars in the trolley when we next visited the supermarket. When the kids need a quick tea between school and evening clubs we just cook up a bit of pasta with some chopped ham, cocktail sausages and grated cheese and that’s their quick bite to eat that they love. This week however they asked me if I could put some of that ‘yummy’ sauce on it (aka Dolmio), they are a bit fussy with ‘other’ jars of pasta sauce, so I added a few spoonfuls of Dolmio to their cooked pasta, heated it up and there you go – two incredibly happy filled little tummies!! This post is an entry for the #Dolmio #ThankGoodness Challenge, sponsored by Dolmio. Jane Plan is a delicious diet plan that is delivered to your door monthly. Having put on weight and overeating since my youngest was born four years ago, I’ve felt really uncomfortable in myself and have a wardrobe full of clothes I no longer wear. With my 40th birthday coming up in March this year, I knew I had to change the way I eat (and drink wine!) to start enjoying life to the full again instead of hiding away in leggings and baggy tops, feeling uncomfortable at social occasions and wondering what on earth I’m going to wear on the beach this year for our family summer holiday! When Jane Plan spoke to me about trying their program, I knew this could be the answer to get me on my way to feeling fit and fab again. With the food delivered to my door, I couldn’t dish myself up oversize portions and along with working and a busy family life, I wouldn’t have to worry making myself different meals to the rest of the family as it was all taken care of for me. So I placed my order with Jane Plan and looked forward to the delivery. 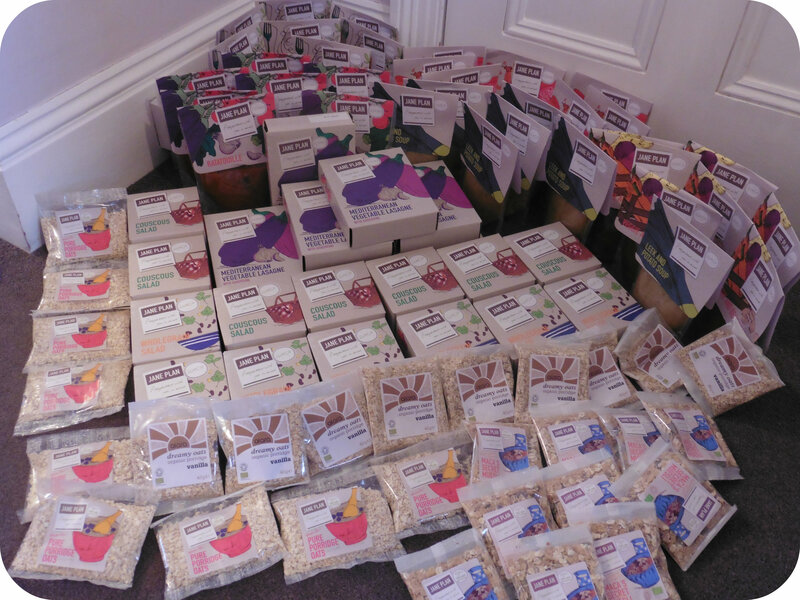 Aimed at providing you with around 1200 calories a day, you are sent your choice of 28 breakfasts, 28 lunches, 28 dinners and 28 snacks from the fairly large choice available. The only thing you need to add is milk or yoghurt to use with breakfast and additional fruit and vegetables to supplement your meals should you choose to. I chose all my meals based on a vegetarian diet and tended to pick soups and salads for lunchtimes and pasta based meals for dinner. When the box arrived it seemed like a lot of food, but had to remember that this was to last me for the next 28 days! Although the meals are long life, they are freshly cooked and packaged using the SousVide method, avoiding any artificial preservatives, colours, or additives. This is done by steaming the food to a high temperature then sealing each portion whilst still hot, thus preserving it naturally. The daily snacks included in Jane Plan consist of either a single small round biscuit or three mini oatcakes. 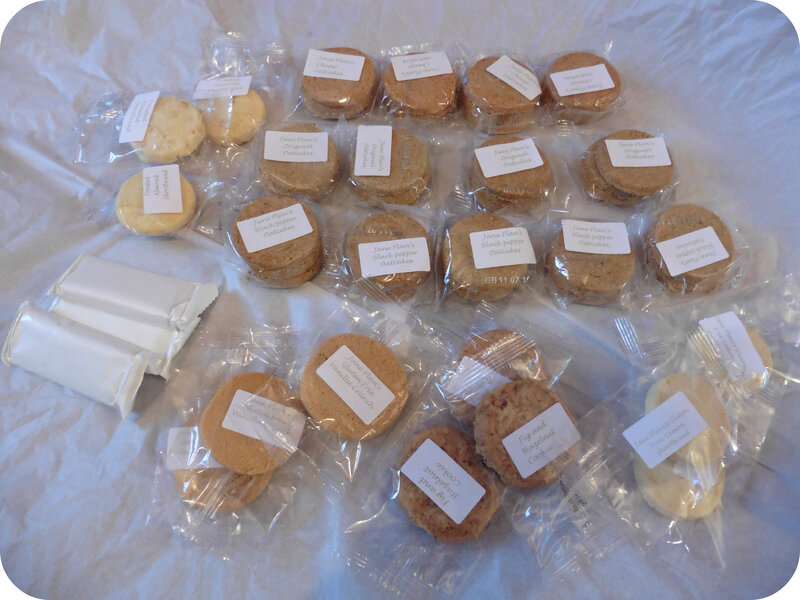 I chose a variety of each in quite a choice of flavours from toasted almond shortbread, to vanilla crunch and fig & hazelnut cookies. The oatcakes came in plain, cheese or black pepper varieties. I was slightly concerned when I saw a lot of these biscuits were gluten free as I’ve not found gluten free products to be very palatable before but there is only one thing I can say about every one of the snacks you see in the above picture – Absolutely delicious!! The biscuits are quite small but they are thicker than your standard biscuit. Every mouthful tasted rich, buttery and just melted in the mouth. I couldn’t wait for my daily snack each day as it really was that little bit of something sweet I craved each day. I did really enjoy the oatcakes too and with three in each pack, it gave me something to nibble on to help beat afternoon cravings. It’s lucky the snacks are individually wrapped as I don’t think I could have just eaten one otherwise! I started each morning with a bowl of porridge or Maca’s Secret Muesli which I added natural yoghurt too. I found all the breakfasts totally satisfying and the perfect way to start the day. They were all quick to put together too, the porridge (both plain and vanilla) microwave in a couple of minutes with some added water in the bowl you eat out of, so no added washing up! For lunches I tended to have soup when at home, which came in a pouch that you simply heat up in the microwave. I usually added a couple of low calorie crispbreads or occasionally a slice of unbuttered bread to help fill me up. When at work or out of the house I opted for a salad, which came in a small pot that just required a fork to eat with. I had both a couscous salad and wholegrain salad to choose from and although I enjoyed them both and found them quite pleasant to eat, they both contained red kidney beans and sweetcorn. I would have preferred them to have been a bit more varied with perhaps something green in them. There is a three bean salad which I wish I had tried, not sure how I missed it but as I’ve mentioned there is quite a lot of choice available on the Jane Plan menu. Dinner time was something I eagerly awaited each day whilst following the plan and have to say I found the meals really tasty. I chose a lot of Mediterranean dishes such as pasta arrabiata, vegetable lasagne and ratatouille. I have to say my absolute favourite is the pasta Mediterranean which was delicious in a rich tomato sauce with peppers and courgettes (two of my favourite vegetables!). The lasagne was good too, once I got used to the fact that it had no cheese on it! lol I have to say cheese was one of the food items I did miss throughout the month. For the first three or four days, there is no denying it was hard!! My body is used to me grazing all day, then enjoying a couple of glasses of wine in the evening. I did find the gap from breakfast (7am) until lunch quite hard particularly on work days, but I had some fruit mid morning to see me through. Likewise going from lunchtime (12pm) through to bedtime which is often 11/12pm with just a small biscuit and a single course of dinner could be tough, but I found my body soon learnt to adjust and the stomach rumbles eased off. I found cups of green tea with lemon (which I really enjoy) to be a big help between meals to see me through and a bowl of grapes in the evening (rather than the liquid variety) would help me last until bedtime. I found having the food ready made and portioned to be an enormous help. I am a working mum with two young children, a husband who works shifts and life is hectic enough. The portions ensured I kept on track and didn’t leave me open to temptation as I know I would have been had I been preparing my own food. This is definitely the kickstart I needed and now feel my body is used to eating less food, so I feel more confident continuing myself after finishing on Jane Plan. Although should you wish to continue they do offer money saving plans if you sign up for longer periods. So as you can imagine, I’m thrilled!! As much as I did stick to the plan, I have to admit to having a couple of glasses of wine one weekend and a couple of other extras sneaking in. But what I have proved to myself is that I can do it and Jane Plan really helped me achieve a great first month’s weight loss. I still have a further couple of stone to lose (yes really – fresh bread/cheese/chocolate/wine all have a lot to answer for!) and then I hope to be at my pre childbirth weight and feel fit and fab throughout my forties! Keep an eye out as I will keep you updated with my progress in the upcoming months. When Plum sent me some of their Little Foodies meals to try, I was really keen to see how well they would be enjoyed by Mister B. I often find myself rushing in the door after a busy day and the first thing Mister B says is “I want my dinner”. I want to try and keep his main meals as nutritious as I can although when time is limited and you have a hungry 2yr old it would be good to have something in the cupboard that is quick and easy to heat up and serve. Vegetable Biryani with Wholegrain Rice – a vegetarian dish with 3 of a toddlers 5 vegetables a day! The first meal that Mister B tried was the Morroccan Lamb Tagine with Apricots & Bulgur Wheat which he seemed to throughly enjoy and tucked into until his dish was empty. One thing I was intrigued about before we tried these meals was the portion size and whether it would be enough to fill a 2.5yr old without be having to top him up after. I’m pleased to say that I found these generously sized and more than enough to fill him up. 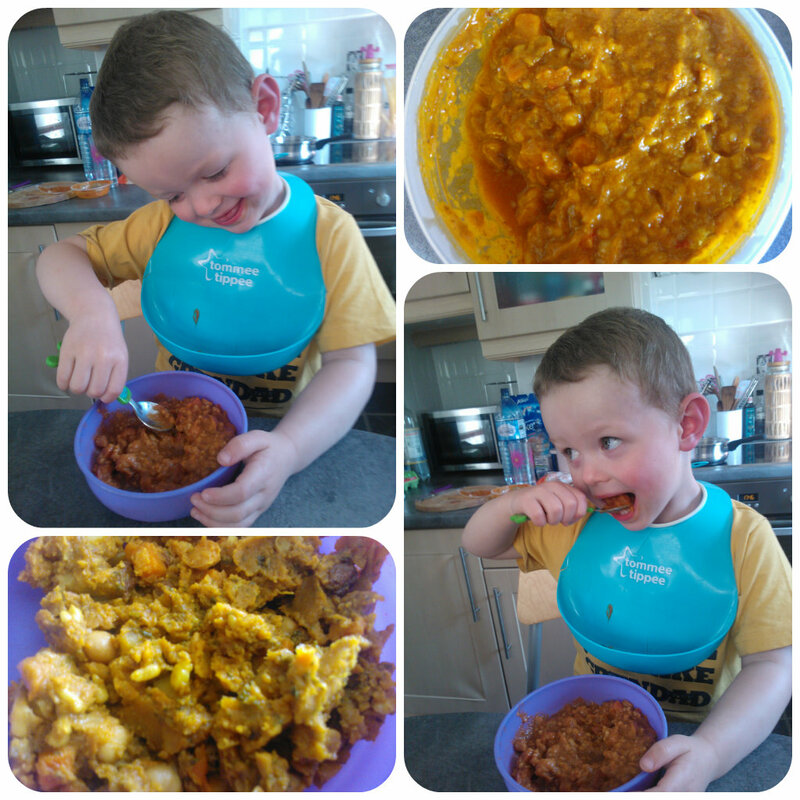 He polished off each meal to the end with the exception of the Vegetable Biryani which he didn’t seem quite so keen on. I think these meals are great for keeping at home in the cupboard for days when time is short, or excellent to take out and about when all you need to do is heat and eat! The nutritional value in these is really high and the variety of vegetables, spices and grains used is really good to give your toddler a good palate and keep them interested in vegetables. We really enjoyed trying these meals and will definitely be keeping a few in the cupboard for those awkward days.